CSIRO scientist Dr Tara Sutherland and her team have achieved an important milestone in the international quest to artificially produce insect silk. 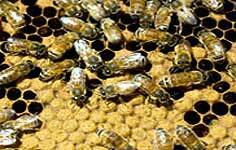 They have hand-drawn fine threads of honeybee silk from a ’soup’ of silk proteins that they produced transgenically. The threads were as strong as threads drawn from the honeybee silk gland, a significant step towards development of silk biomaterials. ’We used recombinant cells of bacterium E. coli to produce the silk proteins, which, under the right conditions, self-assembled into similar structures to those in honeybee silk. Dr Sutherland said numerous efforts have been made to express other invertebrate silks in transgenic systems but the complicated structure of the silk genes in other organisms means that producing silk outside silk glands is very difficult. Possible practical uses for these silks would be tough, lightweight textiles; high-strength applications such as advanced composites for use in aviation and marine environments; and medical applications such as sutures, artificial tendons and ligaments.